Project Description: The New Vision Charter School Addition is a joint-use facility with the Loveland Boys and Girls Club. The single story 24,000 SF building contains a gymnasium, commercial kitchen, cafeteria, and four classrooms for New Vision Charter School. 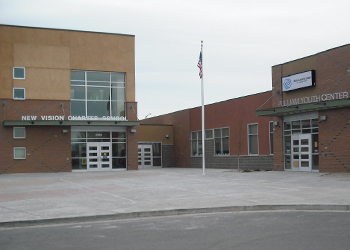 In addition, it includes educational spaces, meeting rooms, art room, music room, computer room and game rooms for the Loveland Boys and Girls Club. The new addition is connected to the existing K-8 charter school by an enclosed pedestrian walkway.